You're watching to Gennady Golovkin vs. Curtis Stevens Fight Results and Video Replay Highlights that would be highlighted soon right after the fight. 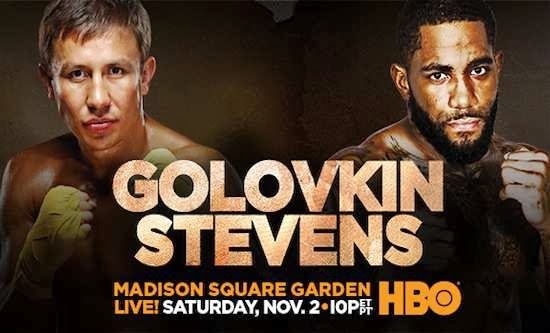 The Golovkin vs Stevens Fight is brought to you by HBO this November 2, 2013 Saturday at MSG, New York, New York, USA. This could be the fight you are eyeing on since Golovkin put off Stevens trash talk. He wants the fight to make it short but all he wants is he would come out victorious right after his battle against Stevens. He will be defending his WBA World middleweight title and International Boxing Organization middleweight title against Stevens. Any predictions of the fight? One of the fight predicitions from the fight fans was "One of the most underrated fighters in Boxing Gennady Golovkin 24 knockouts in 27 fights this guy is on the top of the mountain right now. I wish Floyd fought at 160 that would be a fight" The video replay highlights, fight results, and fight updates of Gennady Golovkin vs. Curtis Stevens will be updated soon. FIGHT UPDATEs: Gennady Golovkin defeated Curtis Stevens via RTD on round 8! He successfully defended his title. Congrats to GGG! Majority of fight predictions will have GGG who would come out the winner of the fight and would not go to the distance. So to speak, the fight will be stopped early as soon as possible since Gennady Golovkin has high knockout percentage. Here's the fight predictions from the boxing fans all over the world. "GGG ALL DAY, I got GGG winning by KO in Round 4. Because he usually takes 1st round or two "off" to see what opponent came with, and then neturalizes the opponent. Curtis talking so much trash cos he scared like Macklin!, GGG will win by ko 3rd round, Golovkin will beat you up Stevens... But try to stay in the fight for at least 5 rounds..., Yup, by the end of the night, Curtis will be all bloodied like Rosado was! Watch for a flying towel photo shot on getty images tomorrow!, This is a tough fight to call, I haven't seen enough of both of these dudes. From what I remember Golovkin being more polished/patient than Stevens. Stevens is the "naturally" the bigger man starting out in Super. I think Golovkin will use his height advantage and wait for Stevens to walk into shots. However...I think there could be an upset if Golovkin allows Stevens on the inside, which is normally what "short/thick" guys like. Golovkin by Stoppage or Decision." There are many predictions of the fight and it was chosen that the winner of the fight would be Golovkin. What's your fight predicition? Golovking believed that boxing is business but at the same time a sport and he's a sportman in the end. In the interview after he was trashed talked by Curtis Stevens, he said "He has big mouth. Talk, talk, talk, every day, on Facebook, Twitter," Golovkin said, mimicking with his hands. "Too much for me. I don't think he's crazy, but he has panic. This is too much for him. He says, 'I will kill him.' This is crazy talk." There's no doubt that Golovkin is a bit pissed-off by his opponent. Or we can say, this is one of the strategy by Stevens so that Golovkin can't fight in his game plan due to this notion. But for Gennady, he is putting more that a serious business for this fight. This is the fight that we will going to acknowledge in the middleweight division, a must to see fight for Golovkin. Let's watch it on! The fight results and video replay of the Gennady Golovkin vs. Curtis Stevens will soon be update right after the fight. Also, the round by round cover updates of the fight will be optionally posted. What do you think for this fight? Who will win this fight? The answer is when the two face off in the ring this 10:00 pm at Theater at Madison Square Garden, New York. I hope you enjoy the fight updates and video replay for Gennady Golovkin vs. Curtis Stevens fight. Till the next boxing installment.